Read an eBook on my mobile phone? I’ll admit I was skeptical at first. Although I’ve been reading books on a Palm OS PDA for years it has a relatively large 3 inch screen. I thought downgrading to the mobile’s 1.9″ screen would make reading impossibly painful. I quickly discovered that I was wrong. I found that I could read just as fast and with as much enjoyment on the smaller screen as with the PDA or even a printed book. Sounds impossible, but I think having a limited amount of text on the screen helps me focus. With a larger screen or a real book, I would frequently skip back to re-read something and then have to search to find my place again. The small screen discourages back-skipping which I discovered I didn’t really need to do for good comprehension. Because the small screen holds just the right amount of text (around 240 characters) to read at a single glance I never loose my place. One of the techniques taught in speed reading classes is to pace yourself by following the text with your finger. The small screen seems to have a similar effect for me. Reading mobile eBooks hasn’t really caught on yet in the West but it’s very big in Japan where mobile eBook sales totaled $58 million US dollars last year. By way of comparison, eBook sales of all kinds in the US in 2005 were only $12 million and I’m sure mobile sales amounted to only a small percentage of that total. So how does one go about reading eBooks on a phone? Palm, Windows Mobile and Symbian users have a number of free readers to choose from. Two of the best are Mobipocket and eReader which both support DRM’ed books meaning that you can purchase and read current best sellers. Mobipocket also has a reader for most recent Blackberrys. Some good smartphone readers for unprotected content are Plucker (Palm) and readM (S60). Almost all the smartphone readers support a full range of formating like bold, italic, images and multiple fonts in the same document and they can read books in many formats without conversion. Don’t have a smartphone? Java ME based readers work on almost any phone. There are at least two mobile websites that offer free Java eBooks for download. Manybooks ( m.manybooks.net) has over 17,000 classic and Creative Commons licensed books and Wattpad (m.wattpad.com) has about 1700 books and documents uploaded by users. I tried both these sites but neither really worked for me. Most books from Manybooks were too large (over 180KB) to load on my phone. Wattpad offers the option to split books into 64 or 128 KB chunks which should have worked but I got a “VM Class Loading Error” trying to run the books on both a Motorola i855 and a Z8. An old Nokia 3650 at least loaded the books but the Wattpad reader only let me read the first pages before it refused to page down any more! I know that books from both these sites do work on many phones so I recommend trying them first. Downloading books OTA is certainly the easiest way to get books on a phone. Eventually I found TCBR (tequilacat.org/dev/br/index-en.html) which stands for TequilaCat Book Reader. It worked perfectly on all my phones. TCBR is a powerful and user friendly piece of software. The way it works is that you run a program called TCBR Shell on a Windows PC to create a custom Java Midlet containing one or more eBooks. The shell knows the capabilities of many popular phones so in most cases the only configration needed is picking the brand and model of your phone from a dropdown. If your phone is not listed, choosing the Generic MIDP 2 option for current phones or Generic MIDP 1 for older ones and a maximum jar size of 64 KB seems to always work. If the book you are building is larger than the maximum, TequilaCat Shell will split it up into multiple files. I think TequilaCat is the only Java app that has worked on every single phone I’ve tried. Creating a book with TCBR Shell is easy. You can either drag and drop files on the TCBR window or click Add and browse for files. A preview pane lets you view the book to check formatting. Once you’ve selected your files, press Create to build your Midlet. By itself, Tequilacat can only create Java books from plain text files, but the latest version (2.2.8) uses plugins to support other formats. The Tequilacat website (http://tequilacat.org/dev/br/help.html) has links to plugins handling HTML, PDF, Aportis DOC, RTF, TCR and Microsoft Word, Excel and Powerpoint documents. The Shell’s file browse will only show files that can be converted using the filters you have installed. Once you’ve created the Midlet all that’s left is to copy the .jad and .jar files to your phone using Bluetooth, a data cable or by uploading it to a mobile file sharing site like Mobango and then downloading it to your phone. It a bit of a shame that there is no way to legally read copyrighted best sellers on non-smartphones. I think the eBook vendors are missing an opportunity by not selling eBooks in Java Midlet form. However, there is plenty of good free reading available. In the US, any book published before 1911 is out of copyright and freely distributable. More and more writers are releasing books under the various Creative Commons licenses. Lately I’ve enjoyed several Creative Commons books by Cory Doctorow, an excellent science fiction writer. I particularly liked his novel Down and out in the Magic Kingdom and his latest work Overclocked, a collection of short stories. Most of Cory Doctorow’s books are available from Manybooks and Wattpad. They can also be found in formats compatible with TCBR on the author’s site and at Project Gutenberg. 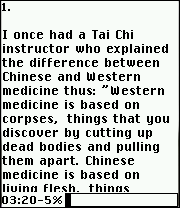 This entry was posted in eBooks by Dennis Bournique. Bookmark the permalink. thanks. i am disappointed with the situation. thanks dennis for the suggestion. but all the links you have provided deals with epub files whereas i am using fb2 files which has to be read with foliant in my samsung phone. I haven’t able to find any information about embedding fonts id FB2 files. It’s probably not supported. I have converted a pdf book with calibre to FB2 format so that i can read it in my samsung c6712. but the converted book shows unrecognised characters instead of the original. the book is in Malayalam with full of illustrations which is a regional language in India.the script is entirely different from english. please help me. is there any special options in calibre so that the output will be ok? I’m sorry, but I only use Calibre with it’s default configuration and only with English texts. I don’t think that Calibre is font aware and depends on eReader or device to supply the fonts. UREKA!Dennis,how happy i am. i finally found out the way. well i tapped the top line, select files-then it says-” foliant may access read user data continue?” i selected >allow.then it goes to> drives <under which listed are– filesystem, graphics, mms, music, photo,and record. here is the problem . my phone does not search for files in the memory card. instead it wants files in the above mentioned folders of the phone memory. i moved the fb2 files to one of the folders listed above and the result is positive.now i would request you to suggest some of the english titles which attracted you.thanks and have a nice day. it is heard that without a reader a jar file can be read by java enabled phone. so i tried traquilacat. with the shell i converted a book . then i copied it to the memory card. when tried to install it in the phone it says not certified. not installed. That’s surprising as Foliant installed and it’s not signed either. Did you inbstall it the same way using jar file? well i tapped the top line, select files-then it says-” foliant may access read user data continue?” i selected >allow.then it goes to> drives <under which listed are– filessystem, graphics, mms, music, photo,and record. i tapped filesystem and get add folder content with a plus sign.if tap there nothing happens. i tapped ok btn and it says the error message " java language null pointer—". may be the reader is incompatible with this device ia have made a search in google to find out any help regarding the reader suitable for this particular model of samsung but failed to get any.even the model's mannual does not have a reference to ebook reading. thanks a lot for the suggestion. i wiil try another reader. i have never read a book on a mobile device. i have got a pdf file in my samsung mobile c 6712. it came when i installed foliant. it is about open source announcement. when i tried to read it is not confined to the screen width. i have only three option goto , brightness, and details.is it the same condition in a ebook reader also? that i have to move every lines with my fingers to read it ?what i mean is can we get the lines within the screen width with a reasonable font size so that we can read the lines without moving towards right on every line. PDF’s are like that but with FB2 or text files the text should fit the screen without the need to scroll sideways. Does it let you continue after the error? If not Foliant is incompatible with your phone. Try other readers until you find one that works. Tapped Select Files,underneath which i get file filter, below this i see a list-text files, fb2 files,archives,and then other files. i tapped fb2 files.there is a green tick mark. but then nothing happens.i am not able to go to the folder in which the book is stored, actually it is stored in the memory card and the application is installed in games folder of the phone. is it necessary to store the book in the same folder of the phone memory? After you select the FB2 files filer, tap the top line where it says Select Files and it should open a file browser that lets you drill down into the memory card (which may be labeled drive E:/ rather than memory card) and select the book file. i copied the foliant.jar to my memory card in others folder.then i have installed foliant in my phone.though i have copied some fb2(converted with calibre)books also to the memory card in the same folder. but i am not able to open with foliant. the installed application is stored in games folder.the library is empty- it says. how can i add the books to the library?.when i first pointed to the books it says not supported format. then what is the supported format in this phone? thanks a lot for the quick reply.kindly ask another one. takes a moment to detect and scan your e-book reader. Click the ‘Send to device’ button in the top tool bar. the conversion and put the book on your reader. I have samsung GT C6712 dualsim phone. i have got the foliant jar folder.what to do next? should i copy the jar folder to the memory card of my phone?. then what to do for the installation? kindly give a detailed instruction please. I don’t have that phone so I can’t give you specific instructions. Try copying the jar to the memory card and opening it with the phone’s file manager. I have LG GS290 cookie fresh phone can i read ebooks in it???? The GS290 supports Java ME apps. Try the Java eBook readers mentioned in the post (Wattpad, Manybooks and TCBR) or Foliant which is a newer touch screen optimized Java reader (review and download links at http://blog.wapreview.com/8651/ ). hai Dennis. thanks a lot for the help you have provided. it is now very clear. have a nice day. thanks alot for thequick reply dennis. kindly put some more instructions as to use the softwares. you suggested three softs viz calibre,foliant, and TCBR. i have samsung c6712 with me. i have some pdf ebooks with me.now tell me how ican convert them into java format and use it in my mobile. do you think that java based ebook will much lighter as compared to pdf format i mean the filesize? thanks and have a nice day ahead. Is there a PC you can use? TCBR and Calibre are both PC apps. 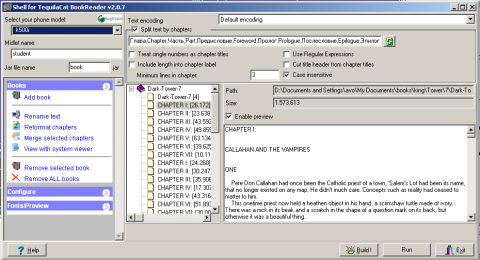 TCBR can create a Java eBook from a PDF. Calibre can convert a PDF into a FB2 eBook that Foliant can read. Java eBooks are about half the size of the same book in PDF format. the description is very useful and illustrative.using samsung c 6712 dual sim mobile.how can i install a java book reader in it and what programme is the best? also provide information as to how to convert pdf format ebook to java? thanks a lot and have a nice day. The Samsung c 6712 runs Java apps so any of the Java ebook readers (Wattpad, Manybooks, TCBR) mentioned in the post is likely to work, as is Foliant which is a newer touch screen optimized Java reader (review and download links at http://blog.wapreview.com/8651/ ). TCBR can import PDF’s and the Open Source PC app Calibre, which is available for Windows, Linux and OS X, can convert PDFs and many other formats into FB2 or text formats supported by Foliant. The Champ doesn’t have a built in EBook reader. You should be able to use any of the Java readers mentioned in the post. Samsung gt e2652 touchscreen,does it support ebook? If yes,send me a link to download ebook. The Samsung gt e2652 runs Java apps so the Java eBook readers mentioned in the post Manybooks, Wattpad, TCBR should work. Links are in the post. i have samsung S 5270.which ebook or pdf readers does it support? The Samsung S5270 supports Java apps so most Java eBoook readers should works. Icurrently using Tecno T8,where can i access the ebook reader on my phone? The Samsung Champ Duos runs Java apps. Foliant is a good touch optimized Java reader (review and download links at http://blog.wapreview.com/8651/ ). The other Java readers mentioned in this post (Wattpad, Manybooks or TCBR) may also work. i have Samsung gt s3310 model and i am big fans of reading books on mobile ,Would you please tell where can i get the ebook reader for my mobile . The Samsung gt s3310 supports Java apps. There are links to three Java eBook readers in the post, Manybooks, wattpad and TCBR. I haven’t been able to get the built in PDF support in TCBR to work lately either. I think maybe a Windows update broke it. Instead I use free Calibre program: http://calibre-ebook.com/about to convert the PDF to text which TCBR. Calibre works well with the PDFs I’ve tried. Samsung SGH e250i? Where can i download an ebook reader for my phone? m presntly using samsung corby GT c3510..i wana noe how cn i read pdf files or ebook on my cell…?? The Corby runs Java apps so any of the Java apps mentioned in the post should work. There’s no Java app that can read PDFs so you need to convert them with TequilaCat or Calibre first. I have Sony Ericsson w595i ..how can I read e-books on it? Install a mobile Java eBook reader like Wattpad, Manybooks or TequilaCat. I have Nokia 5130 xpress music ..how can I read e-books on it? The Nokia 5130 should be able to use any of the Java eBook readers mentioned in the post. I have a symphony ft40 how can i read pdf ebooks with pictures?What software will will support it? And where can I get it? The symphony ft40 runs Java apps. Unfortunately I don’t know of any PDF reader apps for mobile Java. i m presently using nokia x3..wat softwares shud i use 2 start e-readin in my fone?? The X3 runs Java apps so any mobile Java eBook reader should work including the three (Wattpad, MannyBooks and TCBR) mentioned in the post. This was a great help! Thanks for posting this! hi, i just wanna ask which format is best for fido phones? I need more information to answer that. Fido is a Canadian mobile operator not book bookreader app or make or model of phone. The format depends on which bookreader you are using. I have a nokia C3 .. What platform doe it support? what do u think are the files it will support for ebook viewing? and where can i get the software for these? The Nokia C3 runs Java apps. Any of the Java eBook readers mentioned in the post should work. There’s also a new Java reader called Albite that was released recently that uses the ePub book format. Albite is available from: http://albite.vlexofree.com/reader (PC) http://m.albite.vlexofree.com/reader (mobile). i have samsung gt c 3303i .how can i read ebook?which format is best for this? which web is best for hindi e book. The Samsung Champ 3303i runs Java apps so any of the Java readers mentioned in the post (Wattpad, Manybooks or TCBR) should work. However, my PC virus scanner is currently reporting that the TCBR site is infected so I’d stay away from that one. Another one to consider is Foliant (link and discussion at http://blog.wapreview.com/8651/ ) which is a touch screen optimized eBook Reader. Format doesn’t really make any difference, whichever format your reader supports is what you need to use. I don’t read or speak Hindi so I can’t help you with finding Hindi books.